The Episcopal Throne is the seat of the Archbishop of the Archdiocese of Manila. Found at the left side of the main altar area, it is made of the richest and most significant marble that could be culled from the quarries of Carrara, Italy. 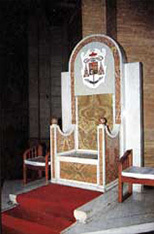 The throne is featured with the escutcheon of the late Archbishop Rufino J. Cardinal Santos, the first Filipino Cardinal. It was under his initiative that the present Manila Cathedral was reconstructed after its destruction during the World War II in 1945.